Jeffrey Welch's Blog: Go Back to School With Your Dog! Editor’s note: Have you seen Dogster print magazine in stores? Or in the waiting room of your vet’s office? This article appeared in our October-November issue. Subscribe to Dogster and get the bimonthly magazine delivered to your home. You and your dog did puppy kindergarten and then graduated with honors from an obedience class. Now he’s all grown up. He’s housetrained, knows all the basic commands, and is well-behaved at home and in public. You’re done training him, right? Doctors, lawyers, and teachers don’t stop learning after they graduate and get their degrees. They take “continuing education” courses throughout their careers to keep their skills sharp and up to date. Training beyond puppyhood is like continuing education for your dog — and it has incredible benefits. Choose something that you and your dog will enjoy training for together. 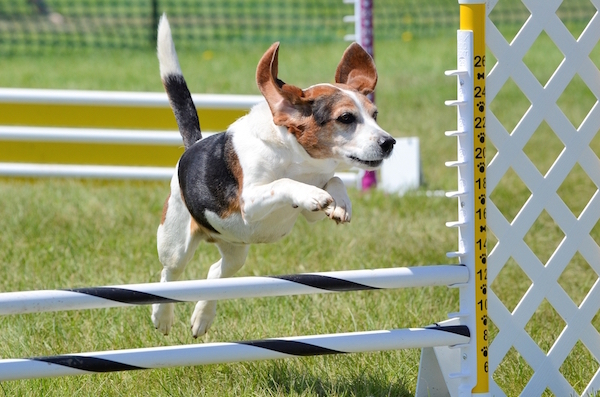 Beagle on agility course by Shutterstock. Dogs who live to chase might love lure coursing (chasing a fake “rabbit” across a field) or disc dog (fun with a Frisbee). Dogs who like running, climbing, and jumping might be in heaven with agility (an obstacle course for dogs) or flyball (a team hurdle-jumping event). Terriers go nuts for Earth dog or barn hunts (simulated rat hunts — no rats are harmed!). Water-loving dogs will adore dock jumping (leaping off a dock into a lake or pool of water). Herding dogs can put their instincts to the test with competitive herding. Even if your dog is of the less-athletic variety, plenty of fun options challenge his brain more so than his body. Competitive obedience, including the less-formal rally obedience, takes the basic commands to the next level. If your well-behaved dog loves people, train to become a pet therapy team, visiting people in hospitals and nursing homes. Trick training classes are great fun, and you’ll love showing off your dog’s new skills. Any dog can do nose work, a sport that teaches dogs how to sniff out specific odors, much like bomb-sniffing dogs. “Nose work gives you the chance for enrichment, problem-solving, and time together,” Penelope said. 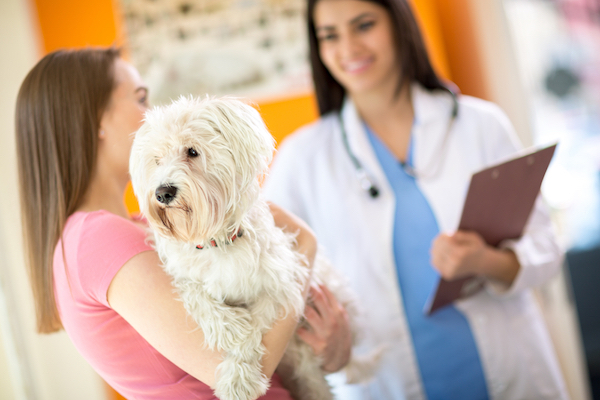 It’s always a good idea to have a veterinary exam to make sure your dog is fit to participate in a sport. Dogs need to be fully mature for activities that involve repetitive jumping (like agility) — wait until at least 1 year old for small dogs and up to 2 years old for giant breeds. No matter what sport or activity you choose, keep it positive and have a good time doing it. “If your dog is not having fun with the training, neither will you,” Penelope said. Dog at vet by Shutterstock. Search online for a training class in your area. Before signing up, ask if you can watch a class (without your dog). Stick with trainers who use positive methods — not force or fear — to get results. of DubDubDog Animal Behavior Services in Laguna Beach, California. “The trainer should be a member of the Association of Professional Dog Trainers.” Also look for certification from the Certification Council for Professional Dog Trainers, which offers the only dog trainer and behavior consultant certifications accredited by the National Commission for Certifying Agencies. If you’re thinking about competing, look up the trainer’s record competing in that sport. “Training your own dog and coaching clients to success are two different skill sets, but you do want to ensure that your trainer can walk the walk,” Penelope said. Does your dog have an issue like barking or pulling on the leash? Maybe he’s reactive toward other dogs. Don’t just keep on living this way — send your dog back to school! Finding a great trainer who can help you reduce or even eliminate your dog’s hot-button issues can make a world of difference in his life and yours. The post Go Back to School With Your Dog! appeared first on Dogster.